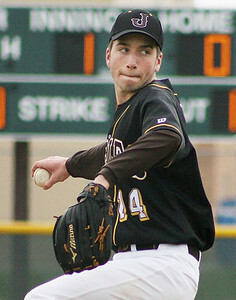 Mike Greene - For the Northwest Herald Jacobs' Evan Blunk pitches during a game against Brother Rice Saturday in Algonquin. The Eagles lost to the Crusaders 4-3. Mike Greene - For the Northwest Herald Jacobs' Max Rider is congratulated after driving in a run during a game against Brother Rice Saturday in Algonquin. Rider drove in three runs in the Eagles loss to the Crusaders 4-3. 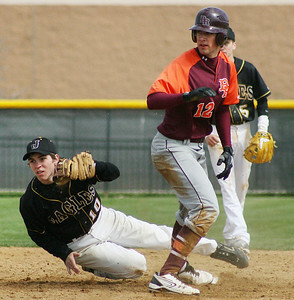 Mike Greene - For the Northwest Herald Jacobs' Matt Hickey (left) attempts to turn a double play as Brother Rice's Brian Mcquillan slides into second base Saturday in Algonquin. The Eagles lost to the Crusaders 4-3. 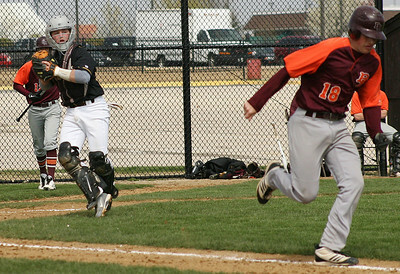 Mike Greene - For the Northwest Herald Jacobs' Greg Sidor (left) fields a bunt by Brother Rice's Neil Gallagher during a varsity game Saturday in Algonquin. The Eagles lost to the Crusaders 4-3. 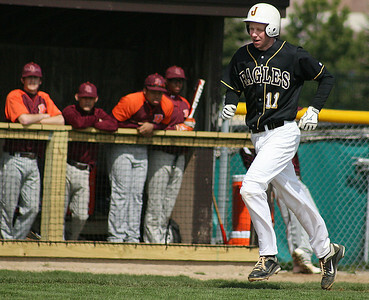 Mike Greene - For the Northwest Herald Jacobs' Max Rider trots home after a two-run home run during a game against Brother Rice Saturday in Algonquin. 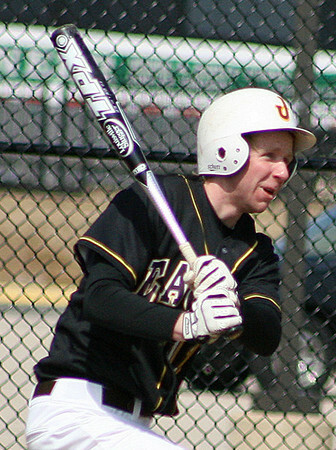 Rider drove in three runs in the Eagles loss to the Crusaders 4-3. 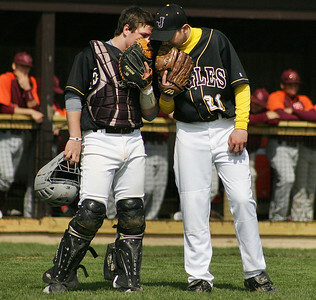 Mike Greene - For the Northwest Herald Jacobs' Greg Sidor (left) and Greg Mixon have a conversation on the mound during a game against Brother Rice Saturday in Algonquin. The Eagles lost to the Crusaders 4-3. Mike Greene - For the Northwest Herald Jacobs' Ryan Ulmer (right) gets back to first base safely on a pick-off play during a game against Brother Rice Saturday in Algonquin. The Eagles lost to the Crusaders 4-3. Mike Greene - For the Northwest Herald Jacobs' Max Rider follows through on a swing that resulted in a two-run home run during a game against Brother Rice Saturday in Algonquin. 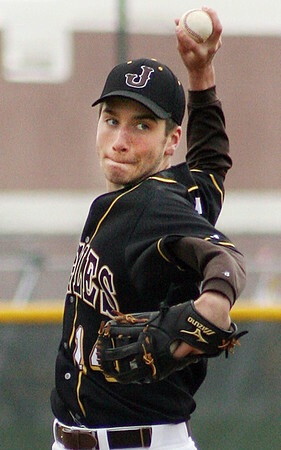 Rider drove in three runs in the Eagles loss to the Crusaders 4-3. Mike Greene - For the Northwest Herald Jacobs' Aaron Traub (right) slides back to first base during a pick-off attempt as Brother Rice's Kyle Bernaciak await the ball Saturday in Algonquin. 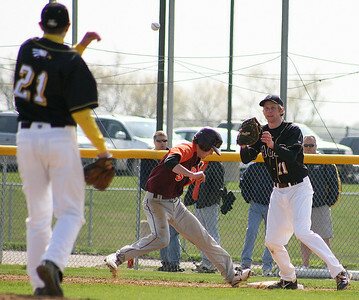 Traub was safe on the play. Mike Greene - For the Northwest Herald Jacobs' Greg Mixon watches the ball roll by from the ground after slipping near the mound during a game against Brother Rice Saturday in Algonquin. 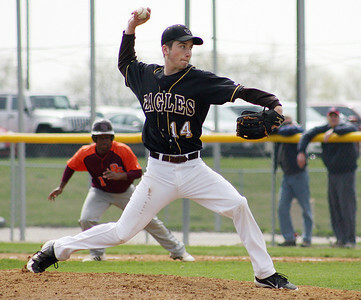 The Eagles lost to the Crusaders 4-3. Mike Greene - For the Northwest Herald Jacobs' Matt Hickey (left) holds up his glove to show the ball after Brother Rice's Garrett O' Neill slid into second base Saturday in Algonquin. O' Neill was safe on the play. 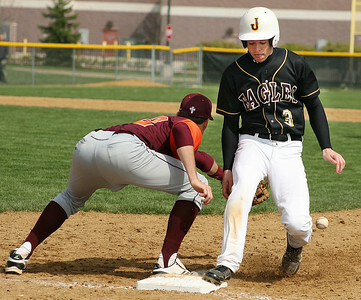 Mike Greene - For the Northwest Herald Jacobs' Max Rider (right) prepares to receive a pick-off attempt from teammate Greg Mixon as Brother Rice's Brian Mcquillan slides back to the base Saturday in Algonquin. Mcquillan was safe on the play. 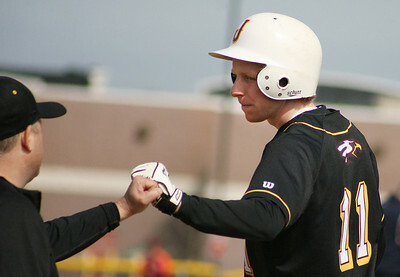 Jacobs' Max Rider trots home after a two-run home run during a game against Brother Rice Saturday in Algonquin. 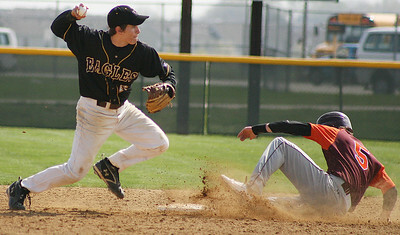 Rider drove in three runs in the Eagles loss to the Crusaders 4-3.